The highest heaven, or the third heaven, is where God dwells though it is agreed that the “heavens of heavens” cannot contain him. The second heaven below is where Satan and his cohorts were demoted after their unsuccessful rebellion. From there, they control the first, and lowest, heaven that holds the sun, moon, and stars—Orion, Pleiades, Arcturus, and Mazzaroth (Job 38:31-32). The principalities and powers in the second heaven use the powers located in the constellations to control the destinies of individuals and communities. Early morning calls from the minarets are perceived as invocations to the princes of the air that control the second heaven, and as incantations for receiving power from the first heaven to control the destinies of cities and the nation. Is the pyramid and Orion part of a two construction building of Babel and that´s how the second heaven controls the first heaven……….. The pyramid is believed, among other things, to have been used as a center for initiation ceremonies; as a mission control and communications center; and as a machine capable of transforming the Earth’s magnetism into microwave electromagnetic frequencies. Some have conjectured that the Anunnaki spacecraft did not have conventional engines but used the Earth’s magnetic field as a means of propulsion. The pyramid was once covered all over with limestone, which shone brilliantly in the sunshine. There are those who believe it was partly used as a marker for incoming spacecraft. Draco was the pole star in 2170 BC. In 2170 B. C. the axis of rotation of the earth was lined up with alpha Draconis in the constellation of Draco (the dragon). “The Slavers have been residing in the 4th dimensional Orion and Alpha Draconis constellations. From there, they project their forces toward Earth. The Slavers have allied with other fourth dimensionals such as Reptilians, Demons, Greys and etheric cyber implant parasitic races to infect humans and harvest the humans’ negative thought forms and feelings as energy to keep themselves distorted.” “The Reptilians from Alpha Draconis and the Greys from Zeta Reticuli are interested particularly in the incarnated ones’ blood and resources, as they are unable to satisfy their thirst. The Slavers from Orion are interested in the energy of the incarnated ones, the thought forms, the emotional feelings, anything to give them power. If there is any way they can twist the human mind and body into distortion they will do it. They want the heart connection to Spirit from each human. 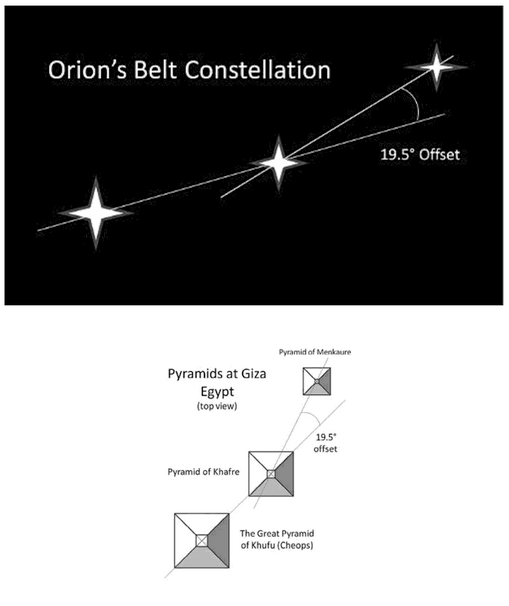 In the case of Earth, the Orion constellations taped into our energy grid with all the pyramids to take what they needed and still do to some degree. Then the reptilians tapped into the planet energy of Saturn and Venus placing a planetoid called the Moon in alignments to control the Earth. These reptilians are of dark energy fitting in with the energy created on Earth called satin. Then add the angelic dark realm that works with Earth and through in the demons and you can start to understand the dark 3rd density of Earth and the Spiritual warfare battle that is being played out on the planet. It is really intense thought process to understand where we live and what is happening. All of these beings, all of these planets know this and like a food chain take what they need and destroy what they want. THE ARCHONS John Lamb Lash has discussed the Gnostic perception of these entities in his book Not in His Image, revealing them as the masters of deception who the Gnostics called the “archons,” beings that exist as “delusional nodes” in the human mind, quasi-autonomous psychic entities, cosmic imposters, and parasites who pose as gods but who lack the diverse factor of creative will. According to the Gnostics, the archons cannot originate or create anything; they are not nor have they ever been creators, though they claim to be. They can only imitate, and they operate through psychic stealth. The Gnostics perceived them as invasive, and unlike the divine Aeons who create without imposing themselves, the archons wrongly believe that they can impress their mentality and their intentionality upon humanity. They want to make themselves like us, but they are constantly foiled by the superiority of the human species, which possesses free will and the capacity for creative imagination. The archons do not possess these abilities. They exist here on planet Earth as an alien life form.